Lina Menard is a small house designer, dweller, builder, consultant, and advocate who keeps a blog called This Is The Little Life, featuring vignettes about simple living in small spaces. 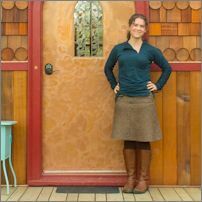 Through her sustainable design consulting company, Niche Consulting LLC, Lina helps people design and build their own tiny dream homes and communities. In Turning Tiny, Lina shares her experience as one of the first residents at Simply Home Community, a tiny cohousing community in Portland, OR, where she lives in her gypsy wagon, The Lucky Penny.